Turn your home into a real Aladdin's cave of wondrous objects! 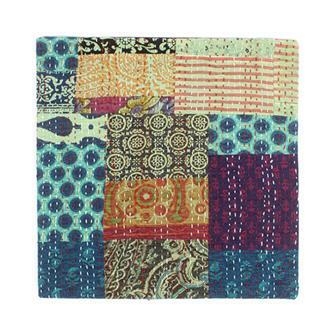 Have a look at our selection of cushion covers, coasters, key hooks and macrame plant hangers! These fantastic coathooks are ideal for reducing clutter in a stylish way. 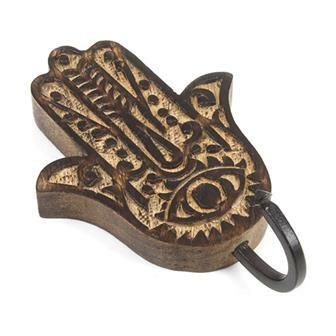 Made from fast growing mango wood and hand carved in India. Why not collect the whole set? 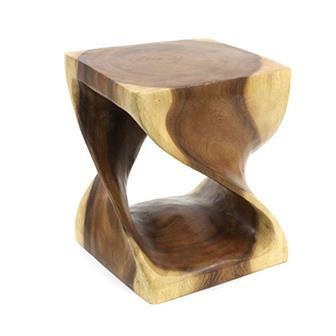 Handsome acacia wood stool, handmade in northern Thailand. These cheeky little items are very versatile making great stools for little bums or as tiny tables to add accent to your home. 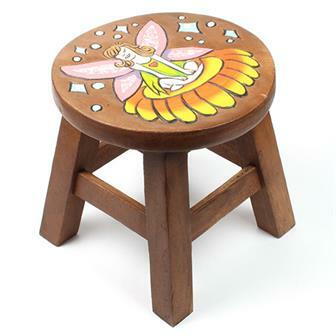 Small acacia wood stool, handmade, carved and painted in Northern Thailand. 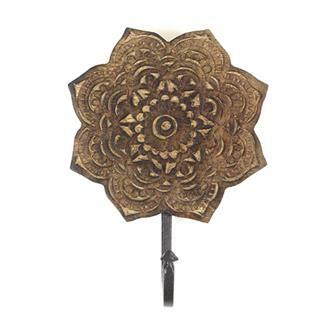 Features an vibrant radiant sun carving with beautiful gold detailing. 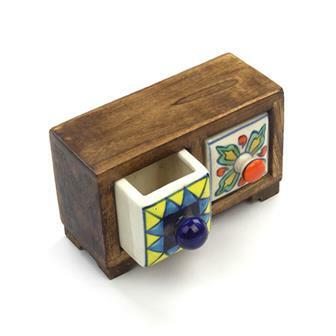 A great little multipurpose item for your home. 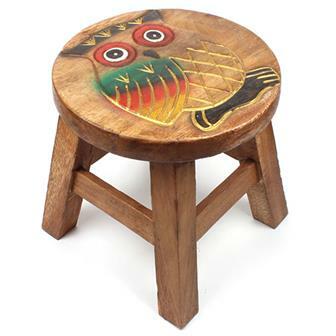 These small but chunky wooden stools each have a beautiful owl carving detail. They are hand carved from acacia wood in northern Thailand. Wonderful little acacia wood stool from northern Thailand. 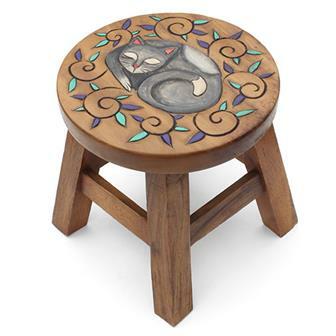 The top of this stool has been carefully hand carved and then painted to show a peacefully curled, sleeping cat surrounded by comfy leaves. 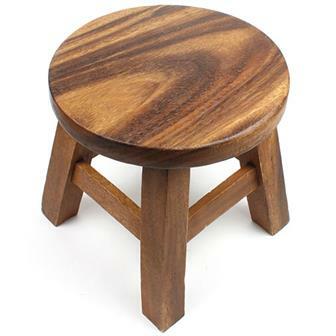 Small but stable, this acacia wood stool is from northern Thailand. The top of this stool has been carefully hand carved and then painted to show a radiantly beautiful peacock, displaying his wonderful plumage. Wonderful little acacia wood stool from northern Thailand. The top of this stool has been carefully hand carved and then painted to show a peacefully curled, sleeping dragon surrounded by flame. 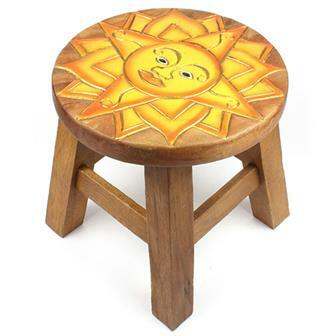 Small acacia wood stool, handmade, carved and painted in Thailand. 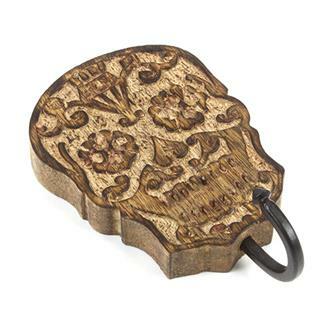 Features a bold candy skull design reminiscent of the Mexican Dia de Los Muertos holiday. These stools are very versatile and make great seats for little bums or as tiny tables to add accent to your home. They can also be very useful as a step for those hard to reach high up shelves or even just to put your feet up on and due to their small form they are easy to store. 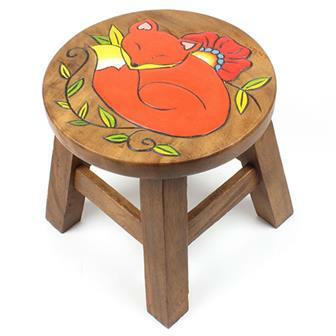 Small acacia wood stool, handmade, carved and painted in Thailand. Features a cheeky winking fairy sat on a flower. 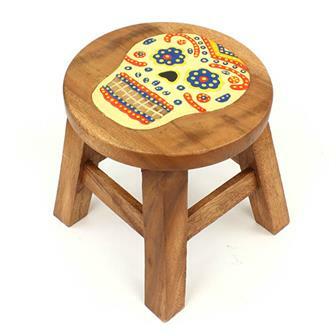 These stools items are very versatile making great stools for little bums or as tiny tables to add accent to your home. They can also be very useful as a step for those hard to reach high up shelves or even just to put your feet up on, and due to their small form are easy to store. Small acacia wood stool, handmade, carved and painted in Thailand. Features an sleepy little fox nestled in flora. These stools are very versatile making great seats for little bums or as tiny tables to add accent to your home. They can also be very useful as a step for those hard to reach high up shelves or even just to put your feet up on, and due to their small form are easy to store. 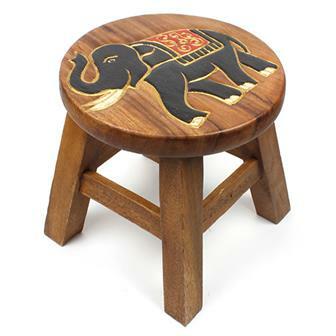 Made in Northern Thailand from rain tree wood, these small but mighty stools are carved from a single tree trunk. Solid and stable, they make great little stools, mini coffee tables or nightstands. 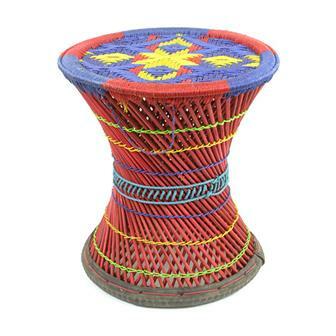 These traditional chairs, known as mudha, are seen all over Nepal and are solidly made using recycled tyres, bamboo and brightly coloured thread. They make very useful little stools to have around the house and will brighten up any room. Based on a traditional Indian quilt making style known as Kantha, these colourful cushion covers are ideal for adding a little extra colour to your living room. Due to the handmade nature of these covers, each one will be unique. 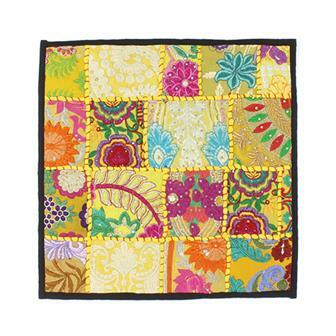 These cushion covers are carefully hand made in India and feature an amazing level of detail. By using metallic threads, sequins and bright colours to create a series of floral motifs, these covers will brighten up any drab sofa or armchair! These beautiful cushion covers from Surati, India use a traditional style of colourful hand embroidery that is sure to brighten up any sofa or armchair. Each cushion is filled with splendid patterns made up of floral motifs, mirror work and traditional embroidered dancers and animals.